Dimensions 5 x 10 x 1 inches. 5 x 10 x 1 inches. 1 x 5 x 6.5 inches. 1 x 5 x 6.7 inches. 5.9 x 3.9 x 1.5 inches. Weight 5 ounces. 13.6 ounces. 3.2 ounces. 1.3 pounds. 7.2 ounces. How to Select the Best Chainsaw Chain? When you’ve broken or worn down a chain and are looking for a replacement, it’s important you choose the right one. Too many chainsaw users are purchasing chains that fit but aren’t appropriate. Chainsaw operators should always consider the work they will be undertaking, the features they require, and the safety levels they need. What may be suitable for one job may not be suitable for the next. Choose wisely and opt for quality every time. The type of work you are undertaking will solely determine the kind of chain you will need to buy for your chainsaw. If you’re a professional with dirty, abrasive wood to fell deep in the forest, you would more than likely opt for a semi-chisel chain. However, if the wood is soft and clean, full chisel teeth will suffice. For wood that is sure to test your chainsaw’s limits, you may even opt for a low profile saw chain. These are chains which handle the bulk of wood – hard and soft. It definitely pays to know what work your chain will be carrying out before you purchase one. This buying guide can help you determine the different kinds of work types in relation to the chain brands and models. Considering the chainsaw is the most dangerous power tool on the market, it pays to have the correct chain and other components in order to get the job done safely. The leading cause of injury and death in chainsaw accidents is caused by kickback. A chain must have accurate depth gauges in order to cut to its full potential. If depth gauges are high it will not cut as quickly. However, if they are too low, there is a far heightened risk of kickback. Match your chain with a quality chain sharpener which can help you accurately sharpen and measure your depth gauges. Getting the right efficiency from your chain can be a balancing act. There are so many factors to consider such as the wood type, the wood’s condition and the power of the chainsaw. A bit of user experience comes into play as well. As a rule of thumb, full chisel chains split wood fibers really quickly, therefore they can get a job done a lot faster if the wood type suits the chain type. Semi-chisel teeth have rounded corners which make them slightly less sharp but more capable of cutting through dirty, dry or icy wood. 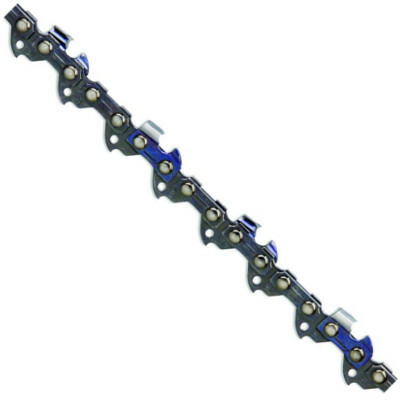 Low profile chains can allow less downtime due to the ability to power through any kind of tree. It can be relatively easy to tell the difference between a full chisel, semi-chisel and low profile chain. The teeth on a full chisel chain are sharp, angled and square. They can also be sharpened to an unmarked edge. 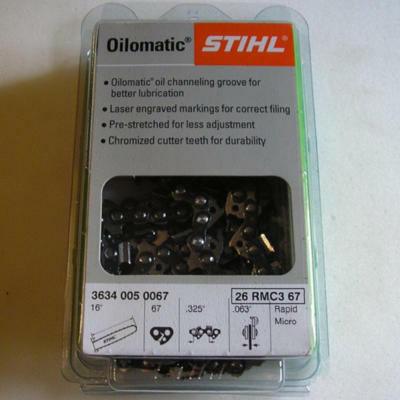 Semi-chisel chains have rounded teeth, whilst low profile chains are generally identified, brand-dependant, by either a colored dot on the chain or the packaging it came in. The colored dot will represent the level of kickback the user can experience from a particular chain. Chainsaw chains are what enables your chainsaw to do what it does best – cut. Therefore, you must always keep on top of chainsaw chain maintenance. Because some chains are so affordable, many people opt to just buy a new one instead of maintaining the current one, but you can easily save yourself some money by caring for the one you have. Sharpening the chain using either a manual or electric sharpener. Making sure the tension is right before use. Making sure the depth gauges are correct. Oiling and lubricating the bar and chain. Clearing debris from the chain when not in use. Replacing it when the teeth are below 4mm. As mentioned in previous buying guides, it pays to buy the best chain, not the cheapest. This could mean making comparisons between similar chains to find out which will provide you with the best bang for your buck. Once you find a brand that works for you, you will undoubtedly stick with it. In most cases chain brands will match that of your chainsaw. It may not be the cheapest, but it may be the chain that works the most effectively and safely. It’s suitable for clean, soft wood that’s easy to cut through. They are one of the most common chain types. They are rarely suitable for professionals who undertake more demanding cutting duties. They can dull quicker than other kinds of chains. Full chisel chains are a great all-rounder chain for a variety of users. However, they are best suited to homeowners with tidy, clean and soft trees that are easy to cut through. The sharp teeth are able to cut through wood fibers with ease. Full chisel chains must be sharpened correctly to ensure they are sharp at all times. You must also keep the chain well lubricated and oiled, as well as checking the chain tension. They enjoy challenging jobs like dirty, icy or dry wood. They aren’t as sharp as full chisel chains. Semi-chisel saw chains are best used by professionals out in the field. Live trees in forest environments can prove trying for even the best saw chain. Trees can be muddy, icy or prove difficult to cut into. A semi-chisel chain aims to work with the tree, not against it and has rounded teeth for the job. Semi-chisel saw chains require the same amount of maintenance as standard full chisel chains. However, you must be more accurate with your chain tensioning, sharpening and lubricating. Because professionals deal with larger, more troublesome trees, only the very best chain in good condition can be used. They power through all kinds of woods in all kinds of conditions. They stay sharper for far longer than standard full and semi-chisel chains. They can generally be heavier. They’re not suitable for all kinds of chainsaws. When you’re faced with a tree that requires a little more effort and persistence, a low profile saw chain is the chain for the job. It’s hardy, durable and remains sharp for far longer. It’s best suited to professionals in forestry environments as it has a higher risk of kickback. Low profile saw chains must be sharpened, kept clean of debris, oiled and the tension adjusted. Ensure all teeth are sharpened to the exact same angle, and make sure the auto oiler on your chainsaw, if applicable, is working to full capacity. It’s very precise in cutting. 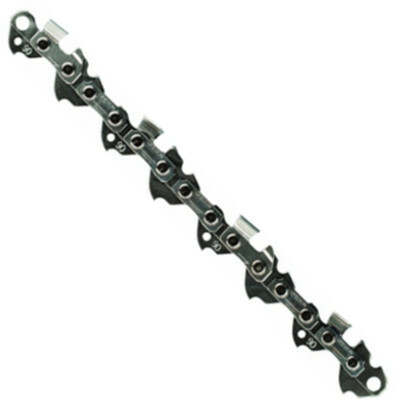 It’s a heat treated and hard-chromed cutter chain for better performance. Some users note they can break easily. The don’t stay sharp for very long. Dimensions: 5 x 10 x 1 inches. QWhich chainsaws will this chain suit? ACraftsman, Echo, Poulan, Homelite and S52. This 14 inch chain fits a variety of chainsaws and offers premium quality to a wide target market. It’s suitable for homeowners and light workers and has been top rated for its quality, reduced kickback and overall durability. It’s very precise in its cutting and is priced for all buyers to afford. Overall it’s easily one of the best chainsaw chains for the money. Check out what other people who purchased this product think about it. Read Oregon S52 full chisel chainsaw chain reviews. It provides the user with a smooth and accurate cut. It offers more technology than many other manufacturers of chains which helps to reduce kickback and provide a better cutting experience. It doesn’t stay sharp for long. Some users experience difficulty in getting the chain to stay on. AHusqvarna, Remington, Makita and STIHL. AProfessional forestry workers, arborists and farmers. When you demand perfection in your line of forestry work, you reach for the 20 inch Oregon chainsaw blade. Built to last and providing a smooth cut for operators, it’s one of the best chains on the market. This chain is full of technology aimed at making it safer for you. It reduces the risk of kickback, all the while ensuring it provides a precise and accurate cut. Check out what other people who purchased this product think about it. 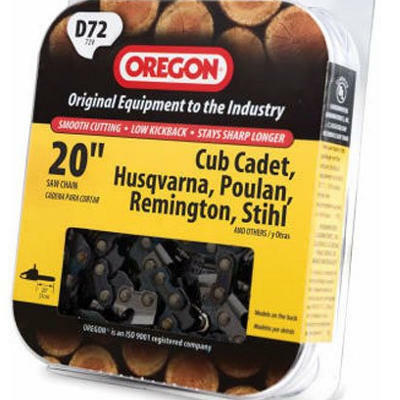 Read Oregon D72 full chisel chainsaw chain reviews. It provides accurate and direct cuts. The chain stays sharper for longer. It costs a bit more to purchase in comparison to other brands. Some users note it can be difficult to sharpen. Dimensions: 1 x 5 x 6.5 inches. AHusqvarna 55 Rancher, 257, 261, 262 XP, 359, 455 Rancher, 460 and 460 Rancher. 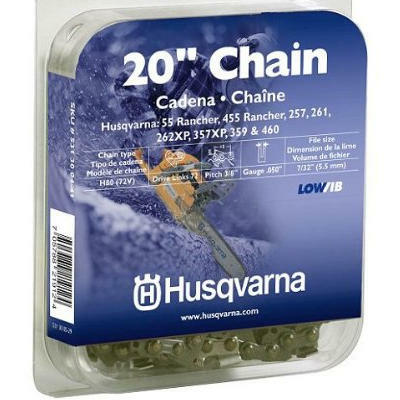 Reviews have been mixed for this Husqvarna 20 inch chain, but it’s still clear to see it’s a quality chain that gets the job done. It’s able to effectively reduce vibrations, it stays sharper for longer and it can provide accurate and direct cuts. However, you take the good with the bad. In comparison to other brands, it can cost quite a bit more than average and some users note it can be difficult to sharpen as well. It’s a quality chain but it may not be the best chainsaw chain for the money. Check out what other people who purchased this product think about it. Read Husqvarna full chisel chainsaw chain reviews. It’s heat treated and hard-chromed in order to provide precise cutting. The chain stays sharp for quite a long time. It can be difficult to put on the saw. Dimensions: 1 x 5 x 6.7 inches. AHomelite, McCulloch and Poulan D70. AArborists, forestry workers and farmers. This chain is packed full of great features to enable it to be one of the best on the market. It features the very latest in chain technology, suits a variety of saws and cuts through wood like a knife through butter. It’s also for sale at a very affordable price unlike some other brands on the market. Check out what other people who purchased this product think about it. 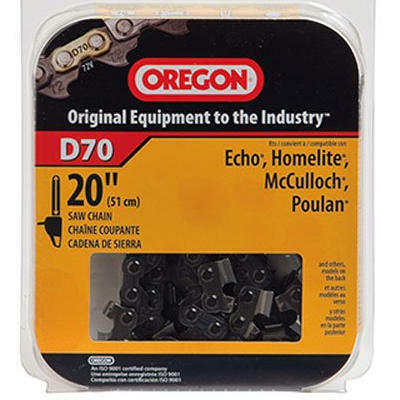 Read Oregon D70 full chisel chainsaw chain reviews. It cuts much faster than an anti-kickback chain. It allows the saw to be quite fuel efficient. The cuts are precise and accurate. The chain remains sharp for quite a number of cuts. It’s not an anti-kickback chain. Dimensions: 5.9 x 3.9 x 1.5 inches. ASTIHL 16 inch models of 024, 026, MS260, MS270, 028, MS280, 029, MS290, 030, 031, MS310, 032, 034, MS340, 036, MS360 and MS361. AHomeowners and lifestyle block owners. Made in Switzerland by STIHL, this chain represents very good buying. It ticks all the boxes in terms of effective cutting, safety, durability and even price. It’s exceptionally well priced and does a very accurate job when clearing up backyard trees. It’s easy to sharpen, easy to maintain and can be installed easily too. Overall this STIHL chain is one of the best for the money. Check out what other people who purchased this product think about it. Read STIHL full chisel chainsaw chain reviews. It has Chamfer chisel cutters for a better cut. The notched bumper drive link ensures the kickback risk is low. The cutting action performed is smooth. For easier loop joining it offers four-way symmetrical tie straps. It’s the best selling chain on Amazon. Some users note this chain dulls easily. Dimensions: 1 x 10 x 5 inches. AS56, Craftsman, Echo, Homelite, Poulan and Remington. AHomeowners and those undertaking light cutting duties. There has to be a reason why this Oregon semi-chisel 16 inch chain is rated as the best seller on Amazon. It’s a chain that will impress time and time again, that’s why. It’s durable, lightweight, offers reduced kickback and costs less than half of what some other leading chains cost. It also cuts smoothly and gives users very little grief. It’s easily one of the best chainsaw chains for the money and that’s been proven. Check out what other people who purchased this product think about it. 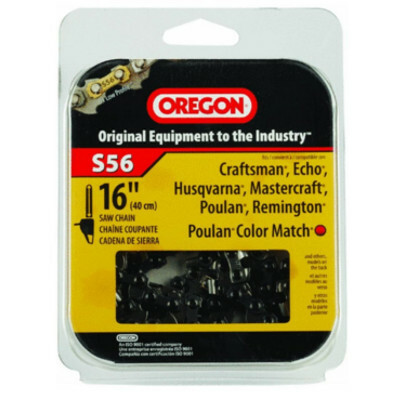 Read Oregon S56 semi-chisel chainsaw chain reviews. It’s heat treated and hard-chromed for better precision. It has a unique cutter for a smoother cut. It offers reduced vibration to prevent user fatigue. Some users note the chain was dull before use – there may be an issue with quality control. Cheap to buy and easy to use, this Oregon chainsaw blade is easily one of the best on the market. It has advanced technology to make it safer with reduced kickback and vibration, as well as being able to make a smoother cut than many other brands. Check out what other people who purchased this product think about it. 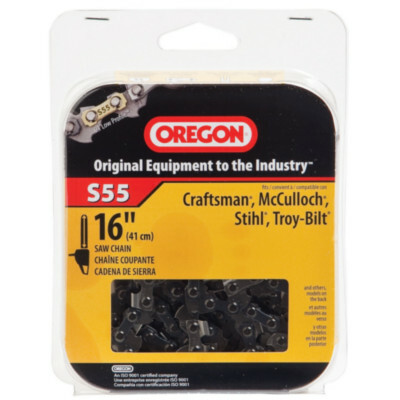 Read Oregon S62 semi-chisel chainsaw chain reviews. It has Chamfer chisel cutters for enhanced performance. It is a very affordable chain. Some users report the chain falling off regularly when brand new. This chain is so cost effective to buy it almost removes the need to sharpen a chain – you can just buy a new one! It’s packed full of technology to keep you safer around home, and it cuts accurately and very smoothly. It also offers reduced vibration and kickback to seal the deal. This top rated chain is easily one of the best chains for the money. Check out what other people who purchased this product think about it. Read Oregon S49 semi-chisel chainsaw chain reviews. It doesn’t vibrate as much as other chains. The Chamfer chisel cutters enhance its performance. It costs very little to purchase. Some users note the chain dulls very quickly. Dimensions: 1 x 9.3 x 5 inches. For the cost of this chainsaw blade you get quite a lot of power and performance. It’s a favorite among many chainsaw operators and cuts through small trees with ease. It also features the best technology available in order to protect the user from vibration-induced fatigue and kickback. In comparison to other brands it offers a lot for such a small price tag. Check out what other people who purchased this product think about it. 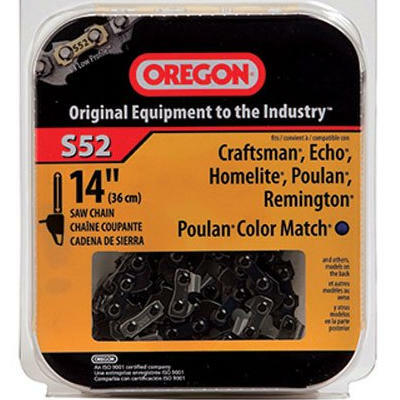 Read Oregon S55 semi-chisel chainsaw chain reviews. There’s a smaller risk of kickback. Users don’t experience as much fatigue due to the reduced vibrations. It has Chamfer chisel cutters for better durability and performance. It has a highly competitive price tag. Some users say it’s dull before its first use. It comes off the bar easily. Sometimes it can be difficult to find a chain for a smaller size chainsaw that still offers good value for money. This Oregon 10 inch chain is a good example of a well-produced less common chain. It has made many homeowners very happy due to its price tag, effectiveness at light trimming and pruning and overall durability. Some users note the chain can dull easily but it’s a small price to pay for such good value. Check out what other people who purchased this product think about it. 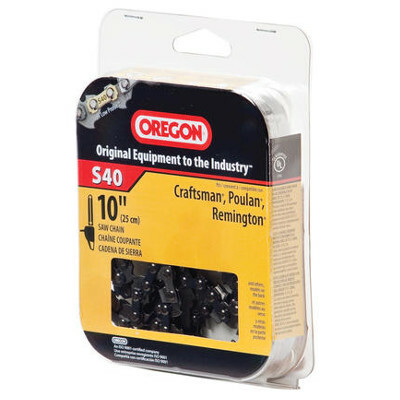 Read Oregon S40 semi-chisel chainsaw chain reviews. It stays sharper for longer. It’s aimed at the professional market because it’s powerful. It heats up quicker and stretches due to being so lightweight. The tension needs adjusted regularly. Teeth can become distorted when the chain heats up. 62 link low profile chain. Dimensions: 6 x 1.3 x 3.3 inches. ASaws up to 42cc and maximum 18 inch bar length. Offering grind-enhanced geometry for chain endurance and a long shelf life, you would be hard-pressed to find a better low profile chain than this one. It’s grunty, gets heavy duty forestry work attended to with ease, and it’s very affordable. The only downside is that it does kick back. If you’re a professional you will know to look out for this. Check out what other people who purchased this product think about it. Read Oregon 91VXL062G low-profile chainsaw chain reviews. It has grind-enhanced technology to make it sharper for longer. It’s very durable and lasts the distance. It has improved speed in undercut modes. It’s not a low kickback chain so should only be used by experienced operators. 56 link low profile chain. ASaws up to 42cc and up to 18 inch bar length. If you’re ever stuck in a bind with a stubborn tree, consider purchasing a low profile blade compatible with your chainsaw. These powerhouses cut through the toughest of trees with ease. However, it does pay to be aware of the dangers of kickback so these are best suited to experienced users. The chains stay sharper for longer, they don’t rust and they just keep going! It’s easily one of the best chainsaw chains for the money. Check out what other people who purchased this product think about it. Read Oregon 91VXL056G low-profile chainsaw chain reviews. The narrow gauge aids in reducing the overall bar and chain weight for easier handling. It requires less power from the saw to get the chain moving. It’s very powerful and accurate with cutting. It’s not suitable for entry level chainsaw users due to the increased risk of kickback. 52 link low profile chain. ASaws up to 42cc and up to 16 inch bar length. ASemi-pro users such as arborists. 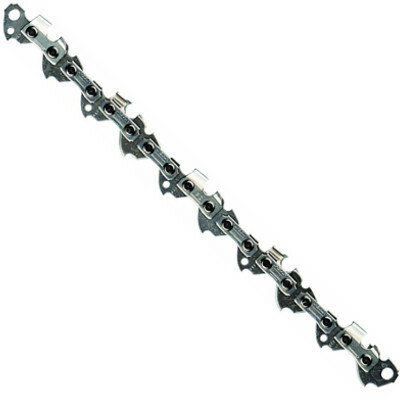 If an arborist is looking for a saw chain that will cut and keep on cutting, this 52 link low profile chain is the answer. It’s suitable for semi-professionals, has good anti-vibration features and requires less power to get going. The chain just never seems to get dull and professionals love this low maintenance feature. With a low price tag sealing the deal, it’s easy to see why this is a top rated chainsaw chain well worth the money. Check out what other people who purchased this product think about it. Read Oregon 90PX052G low-profile chainsaw chain reviews. It has a Lubritec system for better bar and chain lubrication. The Chamfer chisel cutters give better performance. Some users note the chain dulls quickly. Dimensions: 6.63 x 5 x 1 inches. Priced competitively and suiting a wide variety of homeowner’s requirements, this chain is exceptional. It produces very little kickback, offers reduced user fatigue due to the anti-vibration feature and has a very good lubricating system. This gives your chain an extended life. Overall it’s one of the best chainsaw chains for the money. Check out what other people who purchased this product think about it. 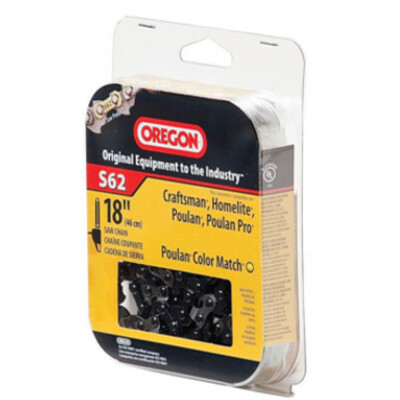 Read Oregon S63 low-profile chainsaw chain reviews. It offers ramp shaped depth gauges and a bumper drive link to reduce kickback. LubriLink tie straps help deliver oil to the chain. Chamfer Chisel cutters give better performance. It’s a very powerful semi-professional chain. It costs more than most other Oregon chains. 63 link low profile chain. ASaws up to 42cc or 18 inch bar or less. Oregon chains are chains that keep on giving. This chain stays sharper for longer, offers reduced kickback and vibrations, and still cuts through wood like a dream. Featuring only the very best technology Oregon has to offer, it is a winner with semi-professional and casual chainsaw users around the world. Check out what other people who purchased this product think about it. 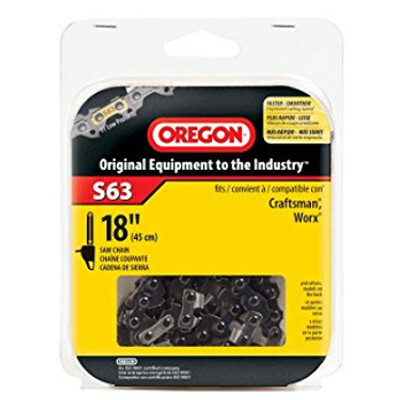 Read Oregon 91PX063G low-profile chainsaw chain reviews. Where to Buy Chainsaw Chains? Chainsaw chains can be purchased both online and in leading hardware and chainsaw stores across the world. However, it’s common knowledge that in order to get the best deal, you should shop online. Websites such as Amazon can offer ‘package deals’ as well as offering a range of competitively priced chains otherwise not found in stores.